Bog / blanket coat « T-Bird\’s crafty Blog! Now, it’s getting chilly round here and my coat is getting thin (and being a big gal they don’t make cheap coats to fit me!) So I thought I’d play with the idea of a bog coat. Was originally going to be just single layer but somehow I got carried away and decided to go for super thick and doubled it up. 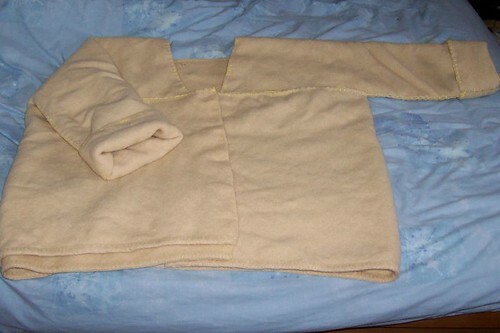 It was originally a thick wool blanket but it had gone to holes in places and was really felted so never got used. 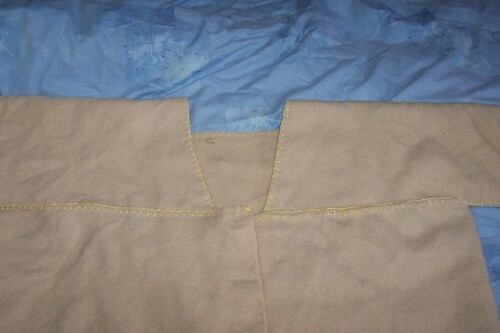 No way would it go through the sewing machine hence the rather rough and ready blanket stitching although I sort of feel it “goes” with the coat quite nicely. I’m thinking about dying it a dark colour, purple appeals but probably will end up blue or black. I’m hoping the cotton stitching will take up more colour than the wool. Neckline (such as it is…) I was really sceptical about how this was going to work and had images of there being a huge cold bit of chest uncovered as you can’t overlap it at all but of course, the neck line only really comes down a couple of inches from your throat before you get to the wider wrap around bit. It’s just a long thin triangle chopped out, about 4″ wide at the back and going back about 2″ from the shoulder fold, sits perfectly over my shoulders. This entry was written by tbird and posted on 4 November , 2006 at 4:44 pm and filed under Uncategorized. Bookmark the permalink. Follow any comments here with the RSS feed for this post. Post a comment or leave a trackback: Trackback URL. ta ladies! I am def. erring towards purple!! but the big question…. toggles (assuming I can find some), buttons or a tie belt? tie belt if you’re sure it would be warm enough, ie not gappy. It overlaps a lot at the front so I I just put a couple of guide loops at the sides to keep the belt from riding up I think it would keep it pretty much where it should be. I’m def erring towards a belt from sheer lack of interest in buttons!